Creating luminous landscapes, infused with vivid colors and loose, expressive brushwork, is quite simply, my passion. I am not trying to replicate the tiny details; I will leave that up to our many fine photographers, of today. I like to simplify my subject matter, using bold brushstrokes and shimmering colors. If, I have accomplished my goal, I have created a magical scene that is even more provocative, than it appears to the casual viewer. I look into the shadows to find hidden colors and give my paintings more saturated colors. I prefer to paint at the beginning of the day, or just before dusk, when shadows are long and the sky seems to have the most interesting color. Those are the times that I refer to the sky as “natures fireworks”. Sometimes, I want the viewer to recognize a place, and other times, I want the viewers to imagine themselves in the scene, because it is so special, or because it evokes a memory of a personal place.Two artists, that I was most influenced by, were John Carlson and Emile Gruppe. I later had the privilege, to study under Gruppe’s famous student, Charles Movalli. Since I have been oil painting since I was, literally, in grade school, my use of cameras has also changed and become even more creative. Therefore, I believe more strongly that I should interpret what I see, and give my paintings fresh, expressive brushstrokes and luminous colors. Karen Schmitz studied at the Silvermine Art School and The Hudson River Art School, under various artists, including Charles Movalli, David Dunlop and Kenn Bachaus, the past president of Plein Aire Painters of America. Karen has been involved in The Greenwich Arts Council, The Greenwich Art Society, The Art Society of Old Greenwich, The Connecticut Society of Portrait Painters, and The Seacoast Artists Guild of South Carolina. 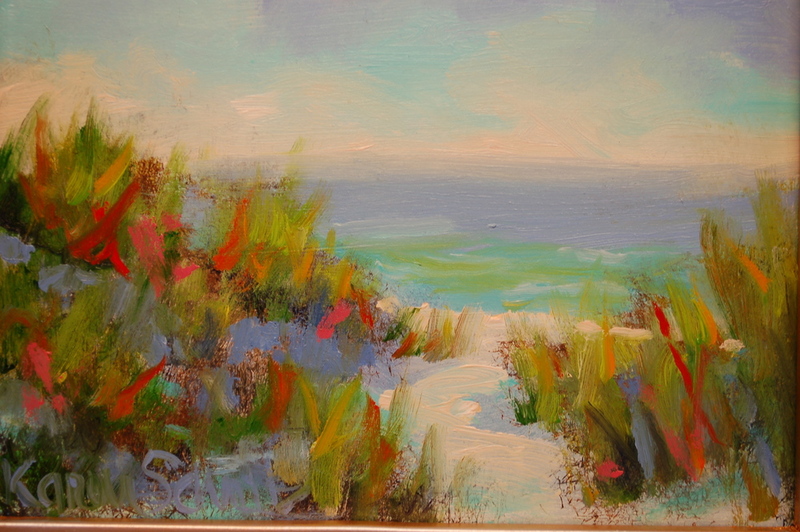 Her works are held in both private and corporate collections throughout the U.S. She has studios in Connecticut, New Hampshire and Pawleys Island, S.C. Her work can be viewed at The Drawing Room Gallery & Boutique, Abigail Fox Designs in Old Greenwich, CT and The Art Gallery of Pawleys Island, S.C.